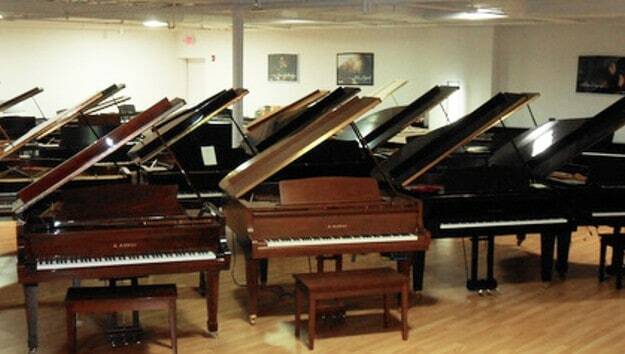 Faust Harrison Pianos has the broadest inventory of premium rebuilt and used Steinway pianos in the United States with more than 100 in stock. Our premium rebuilt Steinways are made from the highest quality parts by our craftsmen and technicians, delivering the “Golden Era” sound and feel for which Steinway became famous. 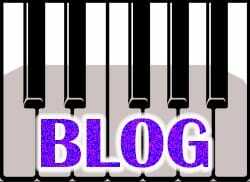 Our nearly new pianos look, sound and feel new but cost much less than brand new models. Previously owned Steinway pianos from Faust Harrison Pianos are maintained to the highest standards of quality, allowing those with limited budgets to own a Steinway. Pianos made by Steinway and Sons are some of the most treasured instruments by professional musicians and amateurs alike. Delicate craftsmanship, superior sound and unrivaled quality combine to help Steinway stand out from others, making these pianos desired for homes, recital halls and professional venues throughout the world. Learning more about what makes a Steinway piano different from others starts by tracing its roots back to the time when they were first introduced to the market. 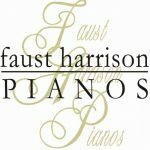 You will gain a greater understanding for the quality and detail put into each piano and why the one you buy from Faust Harrison Pianos is unlike any other you’ll find. Steinway & Sons was founded in Manhattan, NY, in 1853 by Heinrich Engelhard Steinweg. Before starting his company, Steinweg had already built nearly 500 pianos on his own. 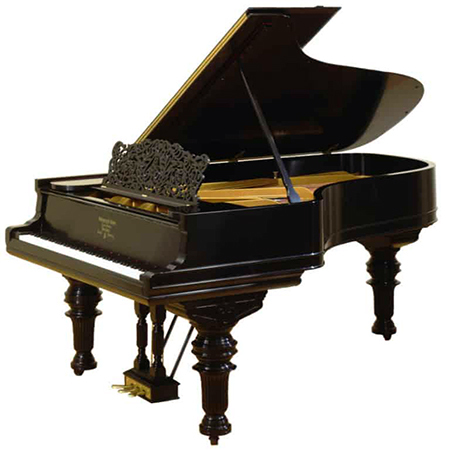 The first one produced by the company in Queens, Steinway 483, can be seen by visitors to the Metropolitan Museum of Art in New York City. Since that time, factories have grown and been widely successful in Queens and Hamburg, Germany. Pianos manufactured by Steinway and Sons in New York are shipped to customers in North and South America, while the plant in Hamburg serves those throughout the rest of the world. Over the years, instruments such as the Steinway grand piano became synonymous with expert quality due to the design and innovation of the piano itself. 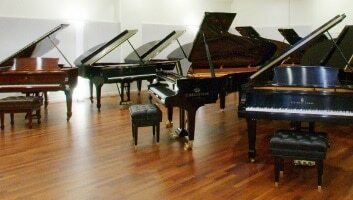 The company secured more than 100 different patents related to piano production, allowing the pianos to remain top of the line and stand out from the competition. As a result, musicians around the world flocked to Steinway & Sons for unmatched sound, a tradition that continues to this day. Innovation does not end with the Steinway grand piano. 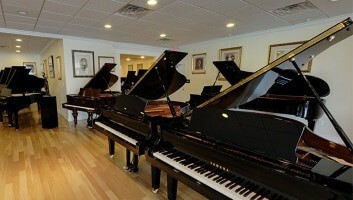 The concept of a Steinway Hall became a reality in the 1860s in New York. 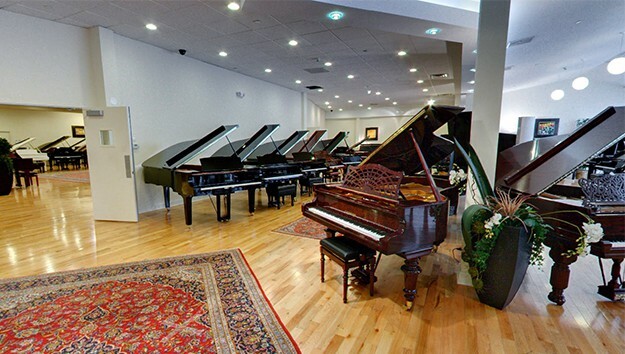 The company opened a large concert venue that featured musicians playing Steinways, which guests could visit after walking through a piano showroom. Not only did this enhance cultural offerings in the city, the Hall layout enticed buyers to purchase more pianos and helped the company grow even larger. The location in New York City was so important to the musical scene that it was even home to the New York Philharmonic for roughly 25 years until Carnegie Hall opened in 1891. Originally located on East 14th Street, Steinway Hall is currently located on Sixth Avenue. There is also a location in London, England, on Marylebone Lane. As the market grew and became more affordable for families around the world, sales numbers took off. The company gave the White House its 100,000th piano made in 1903. In 1938, that one was replaced with the 300,000th made, which is still on display in the East Room. Faust Harrison Pianos has more than 100 Steinways in stock, from premium rebuilt models to nearly new instruments that deliver the Golden Era Steinway piano experience musicians dream of. Learn more about our rebuilt and previously owned pianos by contacting us or visiting a Faust Harrison Pianos location in New York and Connecticut.